Thomas Jefferson’s ancestors were early British emigrants to Virginia. His father was Peter Jefferson and his mother was Jane Randolph, of Scottish descent. He was born at Shadwell Plantation in Goochland, Virginia on April l3, 1743. His father, Peter, was a self-made surveyor-magistrate-planter who married into the distinguished Randolph’s. Two years after Thomas was born the family moved to Tuckahoe Plantation near Richmond. In 1752 the family returned to Shadwell. Thomas, the oldest of eight children was only fourteen when his father died. He inherited nearly 3,000 acres of land which he called Monticello, and later built his home there. He resided there his whole life when not serving in public office. Jefferson at the age of nine commenced the study of classics with a Scotch clergyman named Douglas. In 1760, he entered William and Mary College and studied there two years. In 1762, Jefferson was admitted as a student-at-law in the office of George Wythe. In 1765 as a student, Jefferson heard the celebrated speech of Patrick Henry against the stamp act; and fired by its doctrines, he became a champion of American Freedom. Jefferson was admitted to the bar in 1767 and opened a law practice but disliked court practice so much that he closed his office and never practiced law again. On January 1, 1772, the six foot two inch, slender, red headed Jefferson married his cousin Martha Wayles Skelton a wealthy widow of 23. Soon after their marriage Martha inherited 40,000 acres of land and 135 slaves from her father’s estate. He and Martha had six children before she died in l782, but only two daughters Martha and Mary lived to maturity. In 1769 he was elected a member of the House of Burgesses and served until 1775. In 1774, Jefferson wrote a powerful pamphlet called “A Summary View of the Rights of British America.” It disavowed parliamentary control of the Colonies and contended that they were tied to the King only by their own choice and recognition of mutual benefits. It was addressed to the King and published in England, under the auspices of Edmund Burke. This pamphlet gave great offence to Lord Dunmore, the royal governor of Virginia, who threatened to prosecute him for high treason. His associates in the Virginia Assembly sustained Jefferson and the governor eventually allowed the matter to rest. 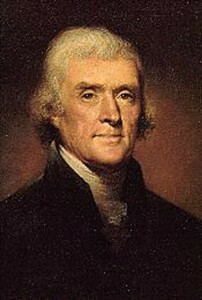 Jefferson was elected a delegate to the Continental Congress in 1775, but due to the death of his mother was absent from Congress from December 28, 1775 until May 14, 1776. On June 11th, a committee consisting of Jefferson, Adams, Franklin, Sherman, and Livingston were elected to draw up a Declaration of Independence. Jefferson suggested John Adams should write the Declaration. Adams declined, when questioned by Jefferson as to his reasons Adams stated “Reason first – you are a Virginian, and a Virginian ought to appear at the head of this business. Reason second – I am obnoxious, suspected, and unpopular. You are very much otherwise. 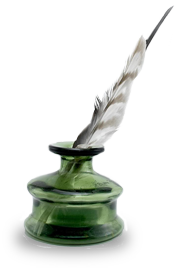 Reason third – you can write ten times better than I can.” At the age of 33 Thomas Jefferson drafted the Declaration of Independence an everlasting tribute to his memory. The document in its amended form is a reduced version of his draft but retains his eloquent writing style. 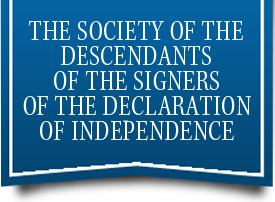 After the Declaration was adapted and Independence voted on Jefferson returned to Virginia. In September 1776 he resigned from Congress. He was elected to the Virginia Assembly as he desired to serve his own state. He received a third election to Congress but declined it choosing to remain closer to home. From1777 until 1779, Jefferson served on a commission revising the laws of Virginia. Of the laws Jefferson proposed one was a law forbidding the importation of slaves, another confirming the rights of freedom in religious opinion, and another established schools for general education. In June 1779, Jefferson succeeded Mr. Henry as governor of Virginia, and the close of his administration was a period of great difficulty and danger. Richmond was partly destroyed in the spring of 1781 by the infamous Benedict Arnold and his invading British and Tory troops. Jefferson and his council narrowly escaped capture. A few months later the legislature met in Charlottesville and Jefferson recommended the combining of civil and military agencies under General Thomas Nelson (also a signer) and resigned his office. Again he narrowly escaped capture by Banastre Tarleton who attempted to capture the members of the legislature at Charlottesville, a short distance from Jefferson’s residence. Jefferson sent his family away in his carriage staying behind to attend to matters when he saw Tarlton’s cavalry moving towards his house, mounting his horse and riding through the woods he later reached his family in safety. General Thomas Nelson was then elected governor of Virginia. On June 12, 1781, it was ordered that an investigation of Jefferson’s conduct be made with reference to the lack of military precaution and expedition. He was formally vindicated by the House of Delegates. Jefferson spent two years in Virginia and during that time his wife Martha died. In 1782, after six years Jefferson again joined Congress. He was appointed in 1784, with Adams and Franklin, a minister to negotiate treaties of commerce with foreign nations. He was accompanied to France by his eldest daughter Martha and observed the beginnings of the French Revolution. In 1784, Jefferson wrote an essay on coinage and currency and to him we are indebted for the denominations of our money, the dollar as a unit, and the system of decimals. When Franklin returned home, Jefferson was appointed to succeed him as minister at the French court and served until 1789. During Jefferson’s absence the constitution had been formed and under it George Washington was elected and inaugurated President of the United States. Upon his return Jefferson became secretary of state in Washington’s administration and in the following years enjoyed interludes at Monticello as well as filling the highest offices in the land. He became Vice President (1797-1801) under Adams, and served two terms as President (1801-1809). The most prominent measures of his administration were the purchase of Louisiana from France, the embargo on the commerce and ocean-navigation of the United States, and sending an exploring company to the region of the Rocky Mountains then westward to the Pacific Ocean. At the close of his second term Jefferson was physically and mentally exhausted and retired to Monticello and private life. He spent the remaining seventeen years of his life regaining his health, corresponding and entertaining statesmen, scientists, and explorers but never ventured far from Monticello. His final project was founding the University of Virginia in Charlottesville in 1819 of which he was rector until his death. Toward the close of his life his finances became particularly distressing to him. He lived frugally in an attempt to stave off disaster and sold off as much land as he could but eventually he fell hopelessly in debt and was forced to sell his private library consisting of some ten thousand volumes to Congress. It became the nucleus of the Library of Congress. Jefferson designed and built his home Monticello and during his years in France he designed Virginia’s State Capitol Building in Richmond and sent drawings to the workers. After he retired to Monticello he designed and helped supervise construction of many buildings at the University of Virginia. Jefferson collected paintings and statuary and was well known as a patron of the arts. He was a noted Scientist in many fields and invented several interesting devices.